Susan Candiotti is a former national correspondent for CNN based in the network’s New York bureau, where she covered regional assignments and breaking news stories. She joined CNN in 1994. Candiotti has covered several prominent national stories and played a key role in the network’s award-winning investigative team covering the Sept. 11 terrorist attacks on the World Trade Center in New York and the Pentagon in Washington, D.C. She reported on the Times Square bomber as it happened, as well as the NYC subway bomb plot — where she was the first reporter to find and reveal video of the plotter buying ingredients for his homemade device. Additionally, she was on the team of correspondents covering the Boston Marathon bombing and broke ongoing developments in the investigation. She was also the first CNN correspondent on the scene of the Sandy Hook shooting in Newtown as the enormity of that tragedy unfolded. She continues to specialize in terror cases and law enforcement reporting. Candiotti was part of CNN’s first team to report at the site of Haiti’s catastrophic earthquake, an experience she counts as one of her most memorable career stories. Among other reporting highlights, Candiotti covered the Jerry Sandusky Penn State child abuse scandal and trial and made headlines when she uncovered emails among PSU officials in which they discussed handling the matter internally without notifying authorities. Other notable assignments include: the Elian Gonzalez story for which Candiotti was asked to write an article for the Harvard Kennedy School; the James Byrd dragging-death trial in Jasper, Texas; the Oklahoma City bombing investigation and subsequent trial and execution of Timothy McVeigh and trials of co-conspirator Terry Nichols. Candiotti also met with McVeigh in prison. She spent more than two months in Montana following the standoff between Freeman government protestors and the FBI in 1996. While in Montana, she also covered the extradition of accused Unabomber Theodore Kaczynski. She has covered a number of air disasters over the years including the Valujet Flight 592 crash in the Florida Everglades, the TWA Flight 800 tragedy in New York and the 2000 EgyptAir Flight 990 crash in Rhode Island among others as far away as Colombia. She was also the first CNN team on the scene of the Miracle on the Hudson. 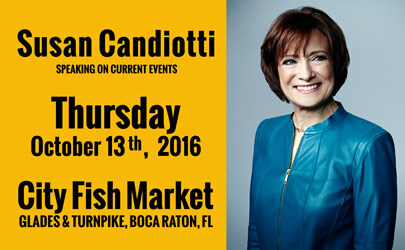 Candiotti also has covered politics including the historic 2000 Florida Presidential recount and 2008 Presidential campaign. Other assignments have taken her to Central and South America, and the Caribbean including Cuba, Haiti, Colombia, Honduras, El Salvador, Mexico, Haiti, the Dominican Republic, and Peru covering hurricanes, earthquakes, hostage standoffs, and political upheaval. She was the first reporter to file live ship-to-shore reports from a U.S. Coast Guard cutter when thousands of Cuban refugees fled Cuba on homemade rafts in 1994. In early 1998, she traveled with U.S. troops to Kuwait. In 2002, Candiotti was part of a CNN investigative team honored with a National Headliner Award for continuing coverage of the Sept. 11 attacks. She was also part of Emmy-winning CNN network of the 1995 Oklahoma City bombing, and contributed to the network’s Peabody award-winning coverage of Hurricane Katrina and the 2008 Presidential election. Before joining CNN, she worked as an investigative reporter at WPLG and WCIX in Miami, where her assignments included the Iran-Contra affair. She received nine regional Emmy awards and an Associated Press award for investigative reporting. Candiotti also has worked at WGR in Buffalo, N.Y., WBNG in Binghamton, N.Y., and WTAJ in Altoona, Pa.
Candiotti earned a bachelor’s degree from Loyola University of Chicago, graduating with honors. She spent a year studying abroad at Loyola’s campus in Rome.